The Lexmark MX810DME printer features a customisable touchscreen display and can handle a wide range of media. The MX 810DME MFP printer is ideal for large workgroups with high volume printing needs. Aside from delivering professional and crisp prints, it can also offer good scans, copies, and faxes. This multifunction unit has a standard memory of 1 GB and can offer a 160 GB hard disk. The Lexmark MX810DME all-in-one mono laser printer is integrated with a duplexer and a four-bin mailbox. Wi-Fi must be bought separately. This model is very impressive and can print and copy as fast as 55 ppm. The Lexmark MX810DME monochrome multifunction printer has a fax machine that has a transmission speed of three seconds and a modem speed of 33.6 kbps. It has a standard paper handling capacity of 1,200 pages that can be expanded to 2,300 sheets. This model weighs around 190 lbs and measures 44.6 x 26.1 x 28.9 inches. 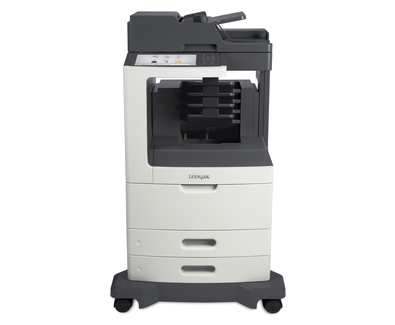 For connectivity, the Lexmark MX810DME black and white MFP offers USB and Ethernet ports. Create in-house marketing materials and documents with the Lexmark MX810DME MFP. This device comes with built-in ADF, RADF and duplexer. The Lexmark MX-810DME printer is easy to use with its organised control panel and is also quick to setup for networking with the Ethernet. Printing directly from or scanning to thumb drives can be done with the USB hosts. The Lexmark MX810DME mono laser printer is very reliable and has a monthly duty cycle of 300,000 pages. Built with productivity in mind, this machine can use extra high capacity Lexmark MX810DME toners to increase workflow. This printer is already expensive as it is and yet the Wi-Fi and other accessories for the MX810DME multifunction printer are additional costs.